This is a review for the supplement Redd Remedies Brain Awakening. The manufacturer claims that this supplement supports brain health. Read on to learn more about this product and whether or not it is the ideal choice for you. Amia- Works to protect brain from free-radical damage. Magtein- Works to support brain health, memory health and cognitive function. Lion’s Mane Fruiting Body- Works to support synthesis of nerve growth and increases memory and concentration. Please note: This supplement is vegetarian and gluten-free. This is good for those who lead a certain lifestyle and have a strict diet. It is recommended that this supplement be taken in two equal doses of two capsules for a total of four capsules daily. Doses should be taken in the morning and prior to bed. There were no side effects listed on the manufacturer’s website. This products costs $58.99 per bottle. Each bottle contains 120 capsules which is a 30-day supply. The manufacturer does not appear to offer a guarantee for this product. With no guarantee, customers may not be able to return the product if they are not satisfied. It is a risk purchasing a product that you cannot return. There are no customer reviews or testimonials available on the manufacturer’s website, so it is unknown if the product has worked or has not worked for anyone who has ordered it. The lack of customer reviews is concerning. 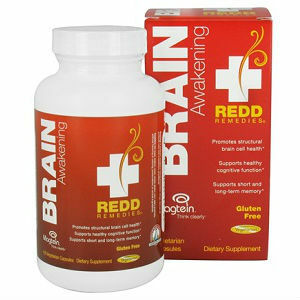 Redd Remedies Brain Awakening is said to support brain health, but there is a lack of customer reviews and testimonials on the manufacturer’s website that back up this claim. Coupled with the lack of guarantee, people may feel as though they are taking too much of a risk by purchasing this item. Not only do they not know if it has or has not worked for someone else, there is the possibility that they will not be able to return the product for a full refund if they are not satisfied. This creates a huge risk when purchasing this product because they may be stuck with a supplement that doesn’t work and once they discover that, they have no way of getting their money back. Even though the product has its drawbacks, the price and the fact that the product is vegetarian friendly and gluten-free may draw in some potential buyers. Those who may have had a hard time finding a brain boosting supplement that is vegetarian and gluten-free won’t be limited by their diet restrictions. The price of $58.99 is affordable for most, so they do not have to worry about spending too much on a supplement. Overall, this product could work for you depending on what you are looking for. Like most supplements, individual results may vary, but it could yield positive results and support your brain health just as it claims. Henry Costa	reviewed Redd Remedies Brain Awakening	on June 22nd	 and gave it a rating of 2.